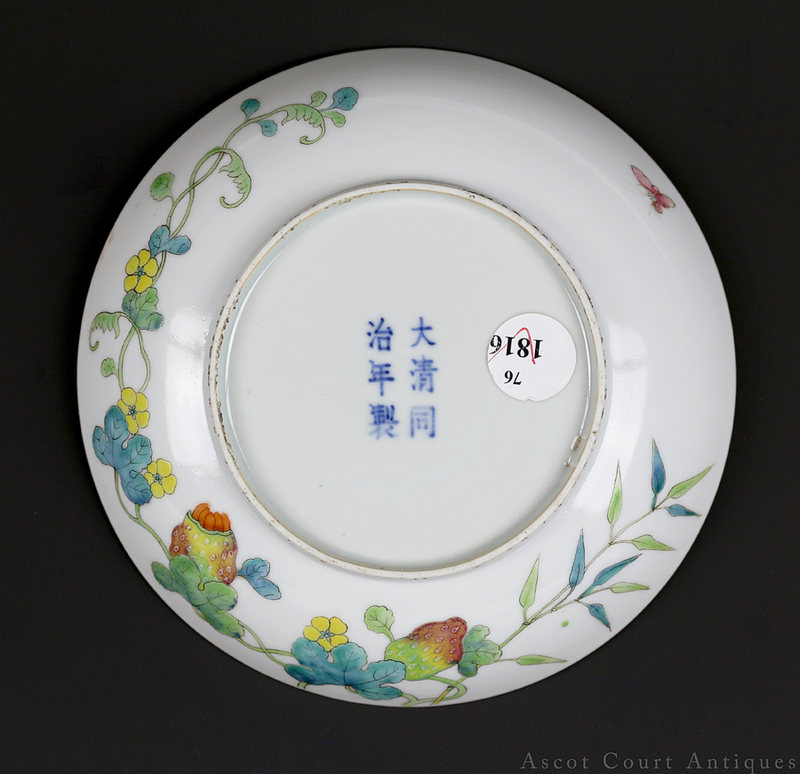 An imperial famille rose circular dish, marked with a six-character kaishu Tongzhi mark and of the period, decorated in the ‘balsam pear’ pattern that’s been a popular staple of enameled imperial porcelain since the Qianlong era. 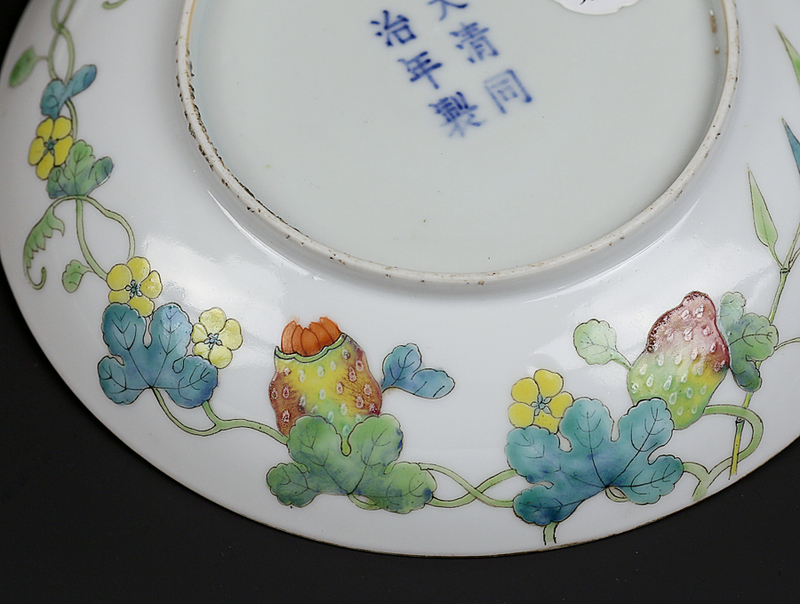 With its layers of leafy foliage, ripened kugua melons, and general representation of abundance and prosperity, the ‘balsam pear’ pattern is also particularly suitable for imperial use due to its long, curling vines that seem to climb continuously through the dish’s front and reverse sides. In a clever use of homonyms, long vines (changzhi 长枝) thus symbolize a long reign (also changzhi 长治). 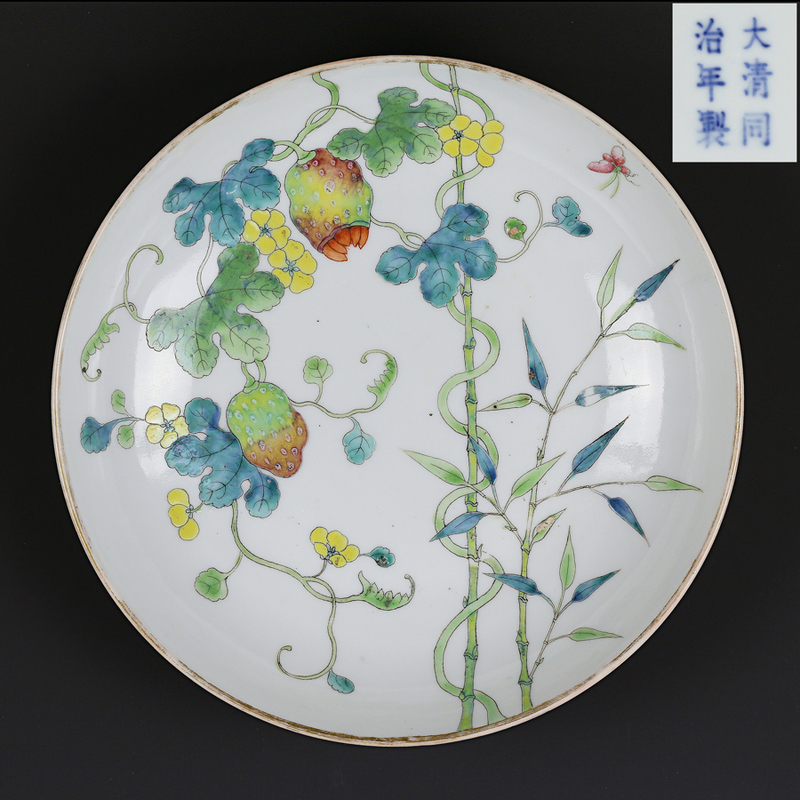 Imperial porcelain from the Xianfeng and Tongzhi reigns are sought after by collectors due to their relative scarcity. The 1850-60s were decades of immense unrest in Qing China, as the Taiping Rebellion sparked civil war and the Second Opium War resulted in the old Summer Palace being razed to the ground. 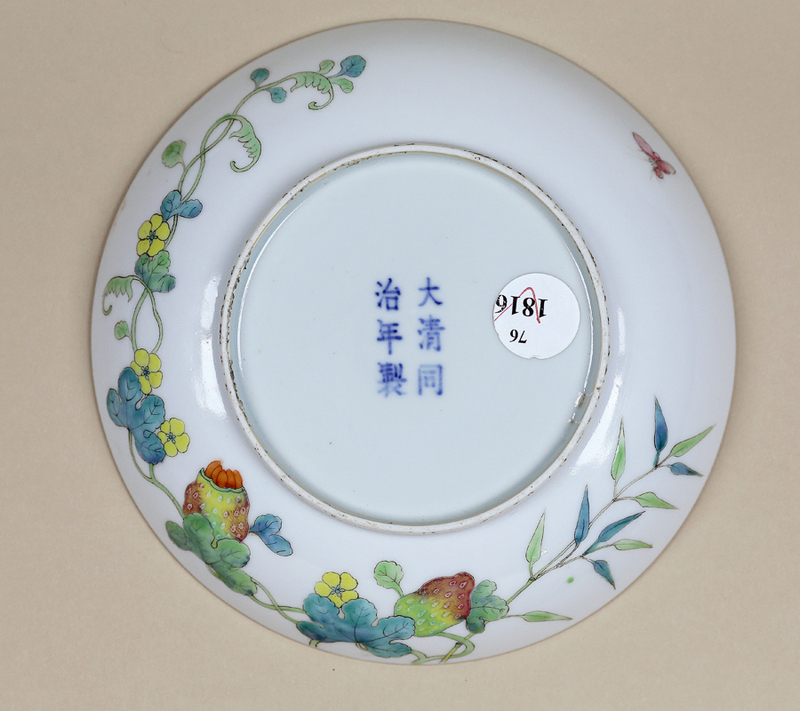 Against the backdrop of disaster, the Imperial Court never fully assumed palace functions and rituals, leading to a decline in orders for imperial porcelain. Furthermore, Jingdezhen itself was devastated and its imperial kilns destroyed when fighting broke out in the area during the Taiping Rebellion. 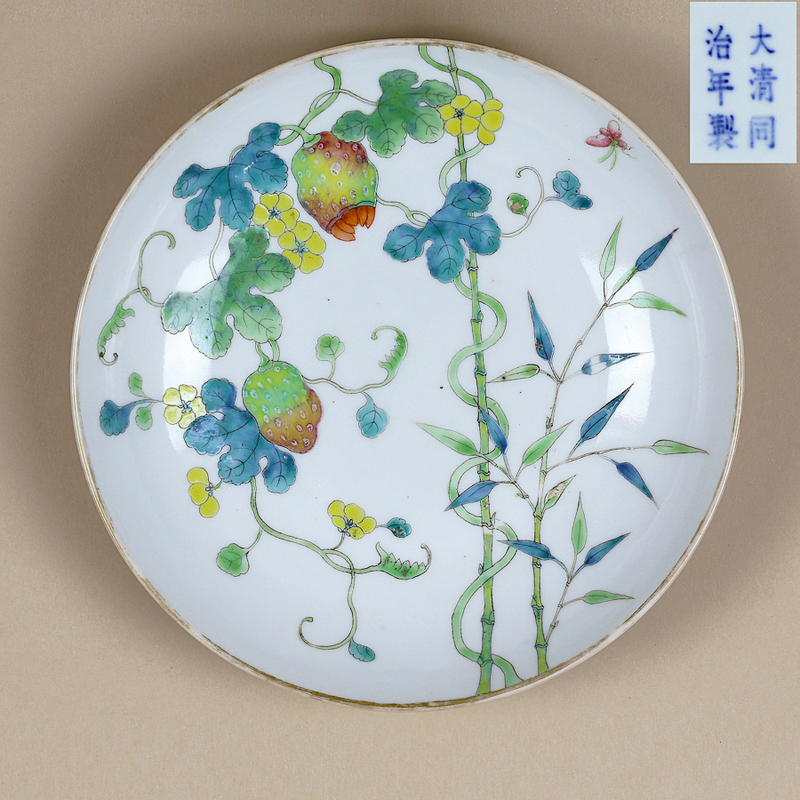 Porcelain production did not resume until Jingdezhen was liberated from the rebels in 1864, and under the leadership of newly-appointed inspector Cai Jinching, the kilns were rebuilt.